The president's son-in-law Jared Kushner has championed the reform push. 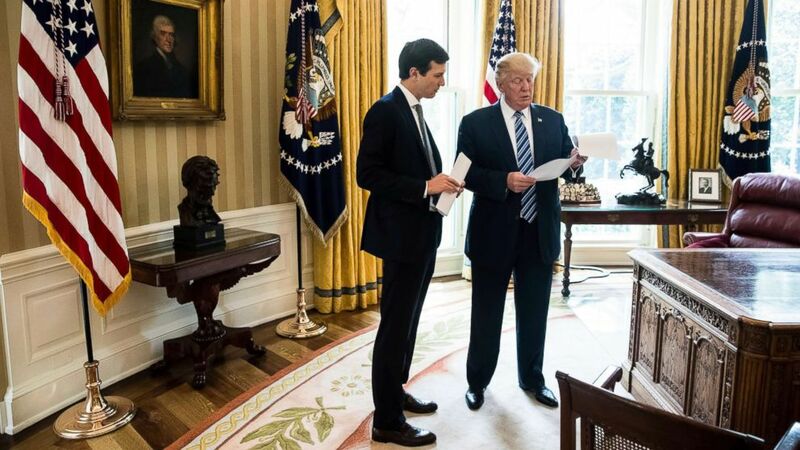 President Donald Trump announced his support for prison and sentencing reform legislation championed by his son-in-law Jared Kushner at a White House event Wednesday afternoon. "Today I'm thrilled to announce my support for this bipartisan bill that will make our communities safer, and give former inmates a second chance at life after they served their time," Trump said. The president hailed the reforms as a bipartisan achievement. "This group reached a bipartisan agreement -- did I hear the word bipartisan? Did I hear that word?" the president said to applause from Republican lawmakers and supporters of the legislation in the room. "That's a nice word, bipartisan agreement on prison reform legislation known as, the first step, and that is what it is. It's a first step but it's a very big first step." The president said the bill would "roll back" certain provisions of "the Clinton crime law that disproportionately harmed the African-American community." He added that the legislation has the backing of law enforcement, including seven major police organizations. "Their backing has ensured that this legislation remains tough on crime -- it’s got to remain very tough on crime -- and supports the tremendous work of our police and the tremendous job that law enforcement does throughout our country, our communities. (Andrew Harnik/AP, FILE) President Donald Trump speaks to White House Senior Adviser Jared Kushner, left, in the Oval Office in Washington, D.C., April 21, 2017. The president urged members of the House and Senate to work fast on getting the FIRST STEP Act pushed through, and ended by thanking his son-in-law for his work on the legislation. "It's my honor to be involved, and it'll be an even greater honor to sign," Trump said, telling Sen. Lindsay Graham, R-S.C., and Sen. Chuck Grassley, R-Iowa, to work hard on getting the bill passed. The president has held back until now from putting his seal of approval on the Senate version of the legislation as he tasked his son-in-law with demonstrating that there is sufficient support among the law enforcement groups for the legislative action, according to sources familiar. Kushner briefed the president on his progress on Tuesday, at which time the administration had secured endorsements from a handful of law enforcement associations, while some other groups that had actively opposed the legislation agreed to stay neutral on the legislation. A narrower version of the bill, titled The First Step Act, passed the House earlier this year. While the House version was focused on prison reform, the Senate language also includes sentencing reforms. There is a measure to retroactively apply updated sentencing guidelines between crack and powder cocaine, will eliminate a regulation that makes it a federal crime to possess a firearm while committing another crime, give judges greater latitude to sidestep mandatory minimums for nonviolent drug offenses, and shorten mandatory minimum sentences for nonviolent drug offenders. The administration’s aim now is to pass the legislation through the lame duck session of Congress. The administration’s legislative efforts on the issue have been complicated in the past by former Attorney General Jeff Sessions’ strong opposition to sentencing reforms. But with the former attorney general's firing, the path for achieving support for the legislation internally was cleared. Kushner, whose father spent time in prison, has cited his family's personal experience with the nation's criminal justice system for his advocacy on the issue.